Todd is one of those people without whom fishing would definitely be poorer - a historian who has a knack of enquiring into the kind of places that others lack the enterprise to tread. 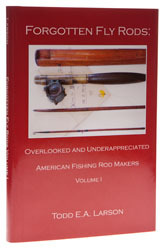 Having done some of my own research into the history of American fly rods, I only wish this book had been available ten years ago, because it shines a light on a generation of American rod smiths who would otherwise be almost totally forgotten. With the exception of Paul Schullery and a few others, historians seem to have entered into a pact which pretends that the US rod trade began with split cane and that greenheart never dirtied an an American angler’s hand; but as Todd points out, there were plenty of craftsmen out there building with traditional materials and when split bamboo came, it was sold into a market that was far more sophisticated than many writers would have us believe. In the absence of any credible rivals, Forgotten Fly Rods will become the standard work on the subject and will prove very useful to anyone seeking information on the personalities and businesses involved. If there is one thing that would improve the book, the illustrations could be done to a better standard - some of the scans would have been better done at a higher resolution - but I await the next volume with considerable interest. The photograph is of the limited edition of 150 copies.